Francisco A. “Frank” Hernandez was the first pediatric cardiologist in the state of Florida, and the pioneer who led many who followed him to continue his work to help children with heart disease. Dr Hernandez was born in Cienfuegos, Cuba, and came to the U S for college, earning his bachelors and MD degrees at the Columbia College in New York City. He returned to Cuba for his medical internship and military obligation and served as flight surgeon at the Army General Hospital in Havana. Political changes on the island led him to move to Miami, in 1945, where he took a position at the National Children’s Cardiac Home, caring for children with rheumatic fever. In 1951, Dr Hernandez became the medical director of the National Children’s’ Cardiac Home- a series of cottages located on Flagler Street at Le Jeune Road- where he developed the newest catheterization and angiographic techniques for that time. Facilities that were also being developed at medical centers in major medical centers around the country. His lab was the first south of Baltimore. Dr Hernandez had the help and experience of Dr Agustin Castellanos, Sr, who was the first person in the western hemisphere to inject contrast- then an innovative radiologic technique to outline the cardiac anatomy. He had worked on this method from the 1930’s. Dr Hernandez maintained his contacts with physician-friends in Cuba, and met Dr Helen Taussig there. She is usually credited as the first Pediatric cardiologist in the U.S. (The photo was taken in Cuba around 1950. Dr. Hernandez is the gentleman 4th on the left. 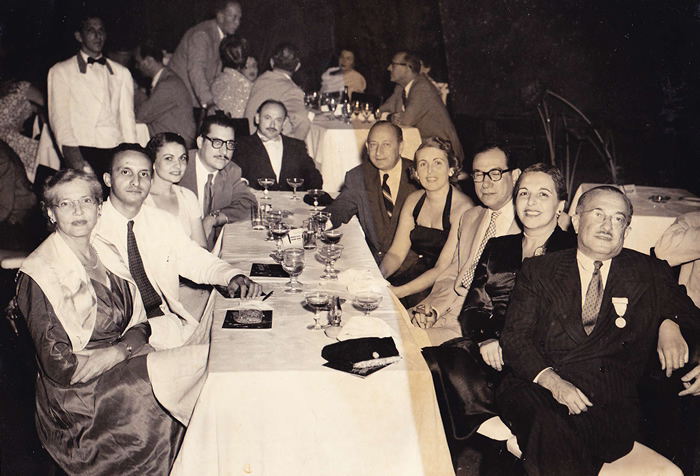 Dr. Helen Taussig is the 1st on the left, Dr. Otto Garcia, the 2nd, and his wife, Dr. Eloina Garcia, the 3rd). The investment in cath lab and angiography technology was supported by the women of the 6 chapters of the National Children’s’ Cardiac Home, and provided him “state of the art“ equipment to diagnose the anatomy of the hospital’s patients. One of these investments was an electrode catheter. Intracardiac electrography was used in the 1950’s to locate the catheter’s position in the heart, to supplement the poor quality fluoroscopy (before current techniques were developed). The value of intracardiac electrogram was described by Dr. Hernandez in the American Journal of Cardiology in 1958 in relation to Ebsteins anomaly of the tricuspid valve. His technician noted that simultaneous pressure and electrical recordings in the atrialized portion of the ventricle resulted in atrial pressures with ventricular electrograms. This provided a safe and precise method of making the diagnosis of Ebstein’s anomaly. Since his technician ( R Rochkind) first noted the different electrogram patterns, Dr Hernandez always gave him full credit for the discovery, and made him a co-author on the report. As penicillin and prednisone therapy improved the outlook for rheumatic fever patients, and methods for heart surgery in children were making progress, Dr Hernandez used these methods to define the more complex anatomy of patients with congenital heart defects, who were previously unable to have accurate diagnosis and treatment. Some of the children operated in those times are middle-aged citizens now, and remember Dr Hernandez with gratitude close to worship. 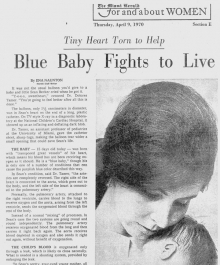 Lady Evelyn Sassoon created the Sir Victor Sassoon Foundation in 1961, and asked Dr Hernandez to help Bahamian children with heart disease. 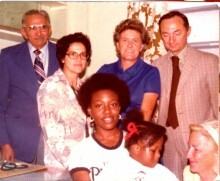 He started his bi-yearly clinics in 1963, and selected the children who would come to Miami for Cardiac cath and surgery. This photo shows Dr Maude Stevenson, the Naussau pediatrician who selected the cases, Dr James Jude, who did the cardiac surgery, and Lady Sassoon, in addition to the patient, her mother, Dr Hernandez and Dr Tamer. In 1964, the National Children’s’ Cardiac Hospital moved from the group of cottages at the Flagler at LeJeune road location to a newly-built hospital on the medical campus- now called the University of Miami Hospital and Clinics. In 1965, the NCCH Foundation, headed by Mr Richard Berenson, made a gift of the hospital to the University of Miami, to support the Medical school programs in research, education, and patient care. With the facilities of the Medical school, and the interaction with the pediatricians and cardiac surgeons at the Jackson Memorial Hospital, Miami’s heart patients were able to receive care on a par with the best medical centers in the country offering such care. This picture shows Dr Hernandez teaching with his friend Henry Cooper who consulted Dr Hernandez on patients in Broward County. Dr. Hernandez encouraged new innovations, such as contrast angiography and balloon atrial septostomy. 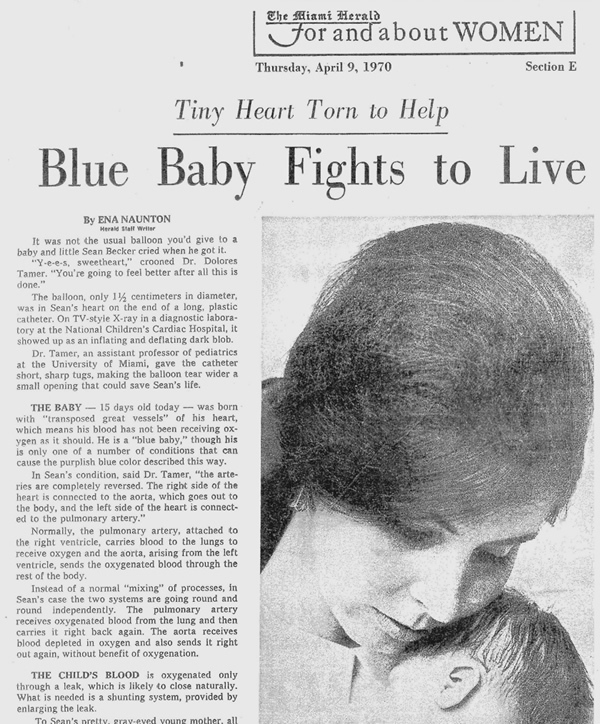 (The photo is taken from the Miami Herald of 1970) The story recounts that the the first Rashkind balloon septostomy procedures in Florida were performed by Dr. Dolores Tamer who was trained by Dr. William Rashkind). She was Dr. Hernandez’ first associate and joined him in 1967. She performed catheterizations at Jackson Memorial Hospital and at the National Childrens Cardiac Hospital (NCCH). Dr. Tamer has been the Director of the Pediatric Heart Clinic and one of the most distinguished teachers of medical students, residents, and fellows. While Dr. Hernandez was the Berenson Professor of Pediatrics (from 1968), and Director of Pediatric Cardiology at the University, Dr. Mary Jane Jesse was appointed Director of Pediatric Cardiology at Jackson in 1969. She created the first Pediatric ICU in 1975 by emptying a 4-bed ward, making a cardboard sign with ” PICU” on it and arranged for additional nursing support. She became president of the American Heart Association, and associate vice president for scientific affairs. She then moved to NIH as Director of Heart, Lung and Blood research. When she returned to Miami it was as vice Chair. When she moved back to Cincinnati, it was as Chancellor of the University of Cincinnati. She recruited Dr.Otto Garcia as Chief of the Pediatric Cardiac Catheterization Laboratory in 1970. Dr. Garcia also had an appointment in Pathology and he distinguished himself in both the catheterization laboratory as well as in his review of all the pediatric cardiac specimens at Jackson. He continued with his interest in catheterization and cardiac pathology throughout his career and made significant contributions to the literature. One of his seminal papers, “Left isomerism and complete atrioventricular block,” published in the American Journal of Cardiology in 1981, is an example of Dr. Garcia’s unusual gift as an investigative scientist and clinician. Dr. Jesse also recruited Dr. Peter Ferrer in 1972 who initially worked on an NIH project in children and their families with the purpose of identifying familial risk factors associated with atherosclerosis and acquired heart disease. 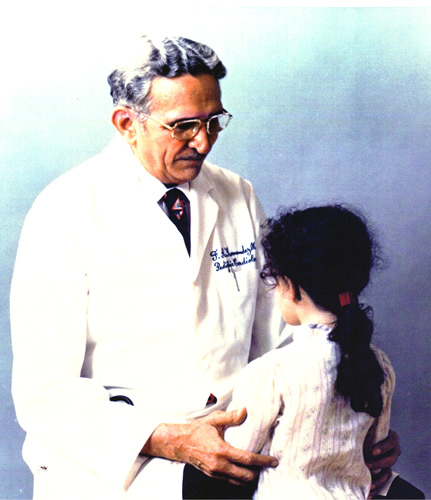 Subsequently, in 1974 Dr. Ferrer started the program in Pediatric Non-Invasive Cardiography at Jackson Memorial Hospital and NCCH and developed the fetal echocardiography program to a level respected both nationally and internationally. In addition to training technicians and fellows in our program, he has trained dozens of physicians from other countries in echocardiography. His original training in adult cardiology led naturally to his leadership in management of the growing population of adult patients with congenital heart disease. His many presentations and publications reflect the many aspects of his medical career and his global influence in our specialty. The earlier experience with intracardiac electrograms was a prelude to the subsequent emphasis of the program on electrophysiology. Dr. Henry Gelband increased the Divison’s focus on Electrophysiology and Pharmacology- in both basic and clinical cardiology. He earned an AHA Established Investigatorship and these interests became a great strength of the program under his Division Directorship from 1976 to 1995. He received the first NIH training grant for fellowship training in electrophysiology. His work in pharmacology, arrhythmias and electrophysiology led to his book of 1977: “Cardiac Arrhythmias in the Neonate , Infant, and Child” which became the primer for pediatric cardiologists everywhere. This had a second edition, and he was co-editor in the third version. Dr Grace Wolff, who arrived in 1977 came with a strong EP background, and pioneered in ablation therapy for the treatment of arrhythmias in children. She was co- editor of the third book to come out of the division: “Current Concepts in Diagnosis and Management of Arrhythmias in Infants and Children” (1998). Dr. Wolff became Division Director 1995 -2005. During her tenure, She served as a member of the Board of Directors of the American Board of Pediatrics, and as a member and Chairman of the Board of Pediatric Cardiology, while continuing a full clinical practice and teaching. Dr. Ming Young served as Division Director 2006-2010, continuing his contributions to the field of Electrophysiology. Dr. William Harmon is current Division Director and Director of our Pediatric Cardiac Critical Care unit. He has continued to foster aspects of pediatric cardiology including Cardiac Transplant, Adult Congenital Heart Disease, Interventional catheterization, and Fetal Medicine programs. The fellowship training program established in 1975 by Dr Gelband was one of the first in the country. This has permitted dozens of physicians to benefit from the experience in the shadow of Dr Hernandez as his “cardiological progeny.” It has provided pediatric cardiologists to bring this expertise to Florida and to the national community. It is interesting that all these folks are needed to continue the original work of Dr Hernandez. Dr Hernandez retired in 1973. He died in 1985 at 77 years of age. View more photos of Dr. Francisco A. Hernandez over the years.